All data used in this piece came from Finance Yahoo. 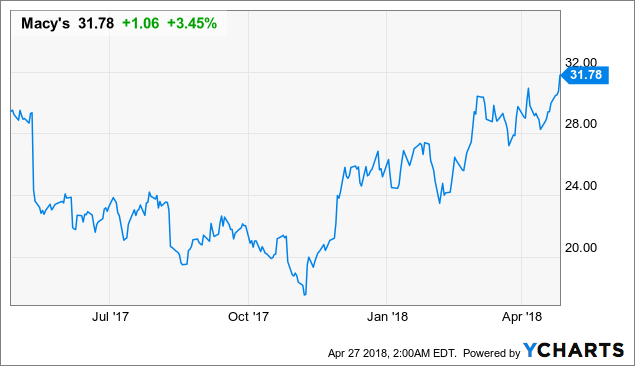 Macy’s (M) stock has enjoyed a strong run over the past six months or so, after having undergone a painful slide that began in July of 2015, shortly before the broader fallout in the global stock market (SPY, ACWI). Shares touched a low of $17.41 on November 7, 2017, and since then the company has been experiencing a renaissance in investor confidence, as expressed through the rebounding share price. The reasons investors shift their beliefs about a company’s future are both fascinating and contentious. In any case, the investment community looks to be revisiting just how much pessimism over Macy’s future prospects is warranted. The endeavor to generate outsized risk-adjusted returns (“alpha”) can be approached in a number of different ways. Some may build discounted cash flows in an attempt to determine intrinsic value, while others look at thematic shifts such as a switch in management, a new product offering, or a change in the competitive environment. Whatever the approach, our belief is that investors can benefit by understanding the market risks that have accompanied the shares from a statistical standpoint. After all, “risk-adjusted” is the frequent qualifier used in determining whether returns have been adequate. This article marks the first in a series whose collective focus will be the empirical risks associated with owning Macy’s shares, both on a stand-alone basis and also in relation to peers and benchmarks. Each article will be readable as a stand-alone piece that provides unique perspective to the reader. This piece examines the historical nature of volatility for the shares and considers the current environment in this context. Volatility, or standard deviation of returns, is an important metric for considering risk among practitioners and academics alike. The availability of a liquid options market enhances the validity of this stance, as risk segments can be bought and sold with ease, and options pricing models rely heavily on the concept of volatility. 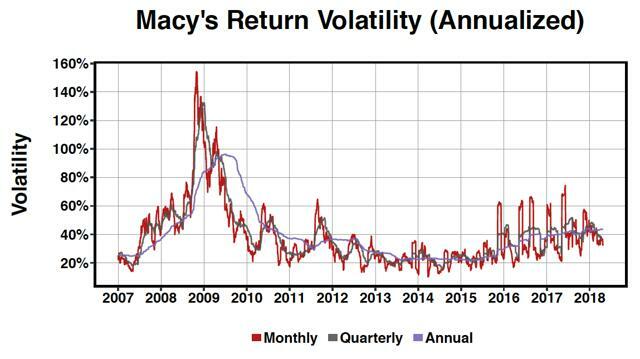 We will examine how the path for historic (or “realized”) volatility has unfolded for Macy’s shares. The period under consideration spans from the first trading day of 2007 and continues into the present. All volatilities in this piece are on a rolling basis; we use various look-back periods to acquire different insights. Above we see a timeline of Macy’s annualized volatility over five- and ten-day periods. If one examines closely, the weekly line (in red) tends to be jerkier than the somewhat less exaggerated bi-weekly volatility measure. Weekly vol for the shares peaked at 240% in late 2008 and has also undergone periodic bouts of renewed price instability despite a general pattern of calming down since the inception of the bull run in equities beginning in March 2009. Many investors likely remember well the painful spike following the earnings disappointment in May 2017 that led to a crash in the shares and a reinvigorated wave of selling pressure. In contrast, today’s levels are more in keeping with the lows of the series. While shorter-term measures of Macy’s volatility shot up to about 240%, longer-term metrics unfolded along a gentler path; for instance, annual volatility peaks at less than 100% (about one year later). Note that among monthly, quarterly, and annual measures of realized volatility, the shorter time frames lead to jerkier, more extreme outcomes (not unlike moving averages). This is one reason why traders tend to prefer shorter periods to execute their activities, while investors often prefer longer investment horizons as time tends to smooth volatility. Taken on the whole, one could reasonably say that Macy’s short-term measures of realized volatility are falling, while longer frames look to be in the process of forming a top. This is an encouraging trend for owners of the shares. Popular implied volatility measures (such as the CBOE VIX®) tend to be based on annualized forward-looking volatilities, gathered from options prices. While this vantage point helps to create an apples-to-apples comparison across different time frames, we will now take a different perspective: that of periodic, non-annualized measures of volatility. What you see above is a visualization of periodic rolling volatilities. 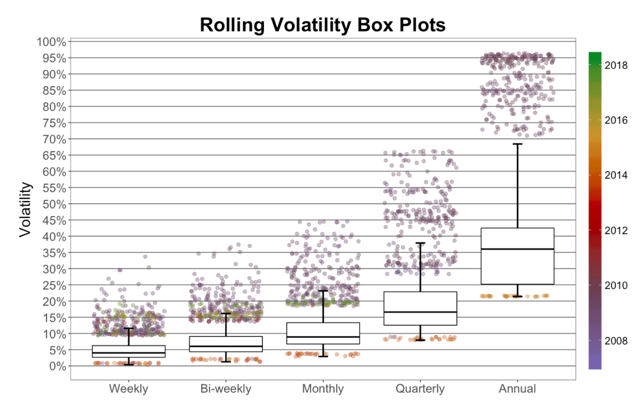 For each time period, we calculate the periodic vol based on the standard deviation of daily returns over that period. 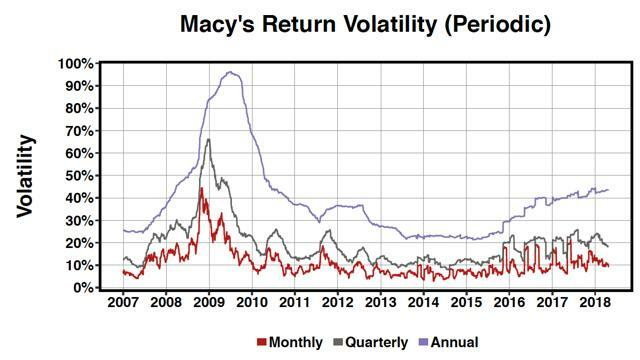 At over 35% the non-annualized volatility in late 2008 was a truly terrifying time to be a Macy’s shareholder. By comparison, today’s near-term vols are printing under 5%. From a theoretical standpoint, volatility scales with the square root of time. Note above that this pattern appears to hold up fairly well (though not exactly in the cases above due to the fact that different series use different quantities of data). Investors are frequently tempted to erroneously extrapolate short-term price gyrations too far into the future. 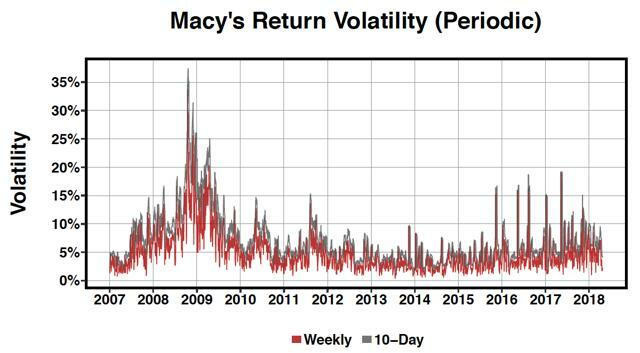 For example, consider that the periodic comparison above is not annualized, and yet the ten-day historical volatility of Macy’s shares is rarely much higher than the five-day. Just as we saw with the annualized vols, there has been a recent downturn for both monthly and quarterly periodic vols. Annual volatility on the other hand has yet to peak as it operates on a lag. Note the frequent leaps in the monthly series that occur around earnings season, in particular for late 2015 through mid 2017. In the box plots below, we have incorporated color-coded dots corresponding the lowest 1% and highest 10% of observations for each series, where the colors represent the timing of the observation. As a reminder on box plots, the bottom of the box indicates the cutoff for the 25th percentile, the top indicates the 75th percentile, and the line in the middle represents the median. By convention, the length of the whiskers is 1.5 times the range from the 25th to 75th percentiles. However, f the data does not extend to that degree, the whiskers will come to an end at the maximum or minimum values in the data. It should come as no surprise that the period of 2008 and 2009 serve as the periods from which we see the highest concentration of upper outliers in the box plot series. It is worthy to note that while 2009 contained some of the highest volatility readings, the year also posted some of the best returns for the entire period under consideration. Also, for the weekly through monthly series, observe that bubble colors corresponding to 2017 show up; investors of the big-box retailer have had to contend with some choppy periods over the last year. One might reasonably ask how dire the company’s prospects are in today’s environment relative to what they looked like almost ten years ago in the midst of the global crisis. For each of the periods, 2013 through 2015 look to dominate the bottom in the volatility data. With volatility low and the stock price gliding higher, this was a period where it “felt good” to be a Macy’s investor. Periodic or annualized vol are simply different perspectives on the same underlying reality. As such the percentiles are the same for each. 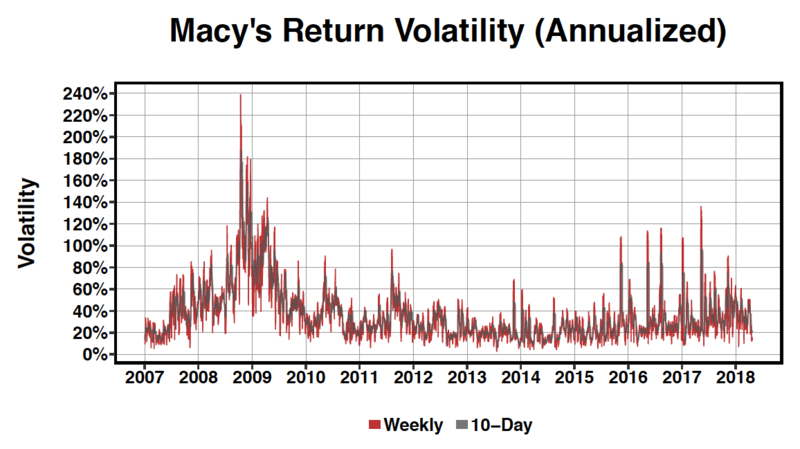 While the S&P 500 is presently experiencing a lot of churn relative to its recent past, the opposite pattern emerges for Macy’s: near-term vols such as five- and ten-day are in the low end of their range going back to 2007. In contrast, the stock’s historical vol over the last year was in the top quartile. Recall that some of the lowest readings for volatility, leading into mid 2015, in retrospect spelled trouble for the stock. We mention this only to say that it is easy to get caught up in the current environment, which may be presently characterized as one of complacency. Macy’s is still in the process of re-establishing itself as an attractive offering. As such, volatility measures on the shares have plunged of late. This may in fact signal a lackadaisical posture for investors. However, the present environment, in contrast to the broader market of equities, is that of increased calm and confidence for the stock. For our part, we suggest that volatility here is a little “under done”, but that the overall trend is very promising. 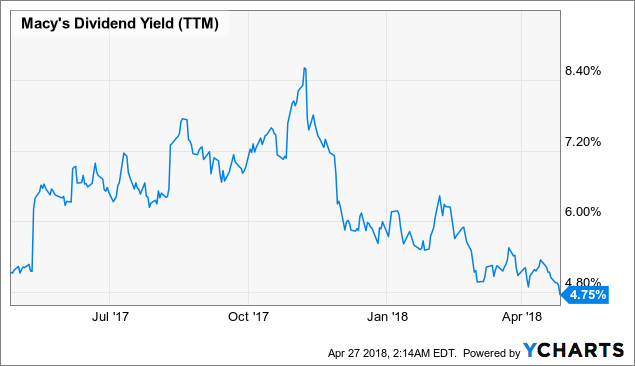 Investors tend to focus on yield more when the shares are not screaming lower. We believe that today’s 4.75% yield, taken together with lower volatility, creates a backdrop for further support. Some investors are uncomfortable with the notion of risk as synonymous with volatility. We assert that vol as a statistical measure does in fact carry value for a number of conceptual and informational reasons. Even so, in the next segment of our analysis of Macy’s, we will turn attention to drawdown analysis, as many consider permanent impairment of capital as the only true risk associated with investment.